I am offering a new leather bookbinding workshop! “Make a Leather bound Journal or Sketchbook” will be 5 sessions, held from 6-8pm on 10/17, 10/24, 10/31, 11/7, and 11/14 at the Union Springs High School art room, Union Springs, New York. 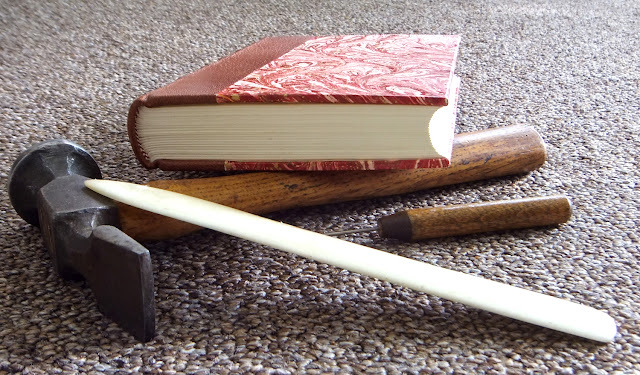 In this class you will learn how traditional leather covered books were made while making your own blank hard-cover book to take home! This is a rare opportunity to work with leather and learn traditional bookbinding techniques. At the end you will have a beautiful hand-made book with leather spine and the knowledge to repeat the process on your own. Materials Fee of $30 payable to the instructor will be collected during the first session. All materials will be provided. Registration fee is $25.